Are you going to fly like a pterodactyl, or are you going to let the Big Blue Monster beat you down? This is a marathon 1-round PDGA Sanctioned C-tier. All 27 holes at Blue Valley set to as long as they will go. Expect the round to last 5 hours. 13,000'+ Par will be around 96. Will know for sure by tee time. All amateur players will receive an Innova Discs Pro Plastic disc and a Maverick logo pin. There will be additional payouts for Intermediate and above. Recreational & Jr players will receive the disc and pin plus a bonus item (your choice of Innova patch, Innova lapel pin, Innova license plate frame or Innova playing cards). While there is a Junior division, small kids are not recommended. This is a lot of golf! 8:45am - 9:30am Player Check In / Registration (required) At shelter near Hole 1 / Hole 11. Admin, will you pin please? Thank you. It's for real. Don't hurt yourself. The prizes are not that big. Like maybe a couple of discs. Coming up in less than two weeks. Two Maverick DG events left for the year. 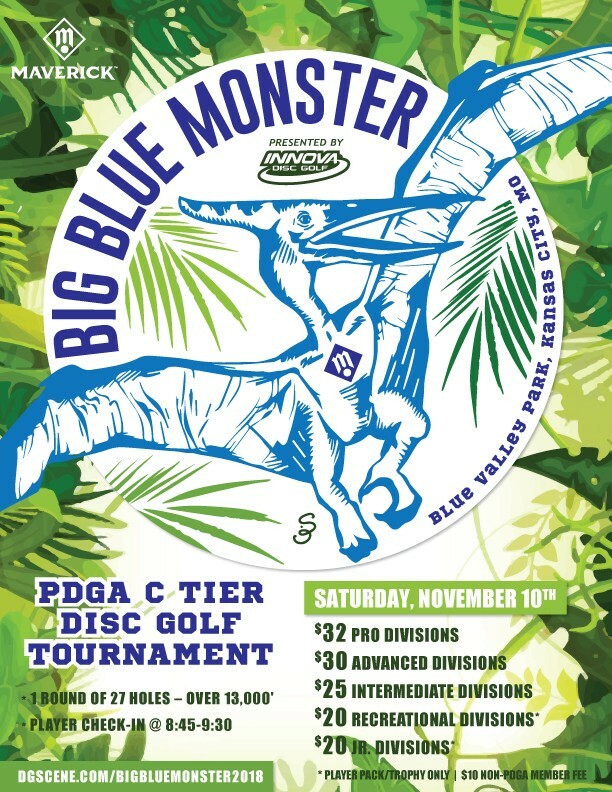 Next one is Big Blue Monster, November 10.